The Coeur d’Alene Coop specializes in the sale of quality heirloom and open-pollinated tomato plants — in a rainbow of colors, shapes, and sizes! We offer more than 20 varieties, some that you won’t find anywhere else locally. All our plant starts are grown by us from open-pollinated seed stock, and several varieties are grown from certified organic seed. We only choose varieties that grow and produce well for the north Idaho climate. 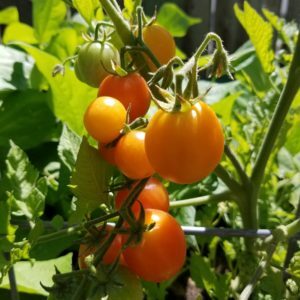 In addition to heirloom tomato plants, we offer a selection of heirloom pepper plants, and heirloom vegetable and herb starts, which includes cucumbers, squash, peas, and various herbs. For those with a small garden or prefer container gardening, look for “Patio Perfect” next to the variety — these are perfectly suited to your small-space needs! Direct from Our Garden: Plants may be purchased in early May directly from our garden in midtown Coeur d’Alene. Please contact us to confirm plant availability and garden times. Farmers’ Markets: You can find our heirloom plants at both the Wednesday and Saturday Kootenai County Farmers’ Markets, early May through the middle of June (or until stock sells out). Online Plant Reservations: PRE-ORDERS for 2019 ARE CLOSED. THIS OPTION IS ONLY AVAILABLE FEBRUARY THROUGH APRIL 9th, 2019. We often sell out of popular varieties early in the season. To ensure that you get the varieties and quantities you want, we offer an online deposit form. We will hold your order for you for a $10 deposit, which is applied to your total purchase upon pickup. Simply let us know what and how many you’d like of each plant and submit the $10 fee via PayPal. We will contact you in early May when your plants are ready for pickup. This is option is only available February through April. 75 days. Dark red-purple fruit, rich sweet flavor. It’s very juicy. An heirloom from Russia with very unique looking, large fruit. 70 – 80 days. Another customer favorite! A rare Russian heirloom with unique, large 8 to 12 oz fruits. A dark red-purple-brown tomato with a rich, deep purplish-brown color. Some say it’s the best tasting of all the dark tomatoes. Very rich, old-fashioned flavor, sweet and spicy. Cherokee Rose (Pink), OP, NEW for 2019! 75 days. From the world of tomato breeder, Brad Gates of Wild Boar Farms, comes this fuzzy (yes, fuzzy! ), dusty rose-colored beauty. Cherokee Rose is a unique variation of the renowned Cherokee Purple. The fruit is large and meaty (6 to 8 oz) and richly sweet true to its Cherokee Purple roots. Generous producer. Indeterminate. LIMITED QUANTITIES AVAILABLE. $5 per plant. 75 days. This large pink beefsteak variety grows to 1 to 1.5 pounds! It’s sweet, juicy and a great slicer. Originating from Germany. 80 days. These very large tangerine colored fruits weigh in at around one pound each. The vines are very productive and heavy yielding. The fruits are low acid and have a tropical fruit flavor — incredibly sweet for a large tomato. My new favorite! 75 days. Beautiful chartreuse with deep lime-green stripes. Flesh is bright green and very rich tasting, sweet with a sharp bite to it. Medium size fruit. 65 – 75 days. Big, beautiful, and early!! Beefsteak fruit is pinkish-brown with metallic green stripes — juicy and sweet. Stocky plants are a bit smaller than other indeterminate varieties. One of our favorites! 60 – 65 days. Very early! Flat, slightly ribbed tomatoes produce medium sized (4 to 6 oz) fruit. Suited for cool summer growing areas. Traditional variety from the South of France — very popular in the 40s and 50s. Painted Lady (Striped), OP, NEW for 2019! 75 days. Painted Lady displays a white and green variegated pattern on its potato-leaf foliage — very rare! Meaty fruits are 3 to 4 oz and are slightly heart shaped. Fruit ripens to a reddish/pink hue complimented by golden striping. Painted Lady a true prize for growers looking for both fashion and function. LIMITED QUANTITIES AVAILABLE. $5 per plant. Pineapple, (Striped) Heirloom, NEW for 2019! 75 – 95 days. Pineapple is a very large beefsteak with fruit that can grow up to 2 lbs each! The yellow fruit has red marbling through the flesh and is very sweet. Very low acid. 72 days. Beautiful, large pink fruit (10 to 16 oz) great for fresh eating. Potato leaf variety, resists cracking. Earlier and a better producer than Brandywine, with a sweet, silky texture. One of our favorites. 75 days. One of our favorites! An early and long producer from Siberia. Sasha’s Altai is a great tasting, all-around beautiful tomato. It was chosen by Organic Garden Magazine as one of the 10 best early tomatoes in the world. Seeds have been saved from the UI Extension, Idaho Master Gardener’s Pollination Project Garden. One dollar of the sale price is donated back to the Pollination Project Garden. $5 per plant. 75 days. This is a customer favorite! Stunning, unique and delicious. These long, pointed red fruit have wavy orange stripes. Meaty and flavorful, great for fresh eating or using in salsas or sauces. White Tomesol (white), Heirloom, NEW for 2019! 80 days. Tomesol produces creamed colored fruit weighing in at about 8 oz. Sweet and rich flavor and fragrance! Vines are heavy producers — even for a large tomato. 80 Days. Our first crop grown in Idaho from heirloom Mexican seed was a huge success in 2016. We’ll have a few plants available this year from the original seed stock gathered from Oaxaca, Mexico in 2016 (see photo right). We’ve since acquired Zapotec seed from a US source. The Zapotec is a very old variety grown at elevations between 4,000 and 8,000 feet. Strong plants with very meaty fruit, and just beautiful on the plate! 65 – 75 days. Indeterminate. An all-time favorite! Deep, rosy-purple little cherries are very uniform at 1-inch, sweet and juicy. Crack resistant fruit produced non-stop! Vigorous plant can get 5 feet tall, so staking is a must. 70 days. Indeterminate. Expect huge crops of “chocolate,” pear-shaped tomatoes over a very long season. This pear has the rich tomato flavor that has made heirlooms so popular! Light red in color, overlaid with swirls of varying hues of green and brown. Very unusual and decidedly one of the best! 65 – 70 days. Early, prolific cherry tomato. Yellow fruit have pointy ends and good, sweet intense flavor. Cold tolerant plants are well suited for our climate! Great producer over a long season. 60 – 70 days. This tall wild cherry tomato produces large quantities of small fruits with pink skin and tart flavor. This type of tomato is found cultivated in part of Central America and sometimes growing wild. Large indeterminate vines will need support. 70 – 80 days. Indeterminate. Winner of 2015 Seed Savers Exchange Tomato Tasting. When the parents of James Igleheart of Indiana lived in Connecticut around 1960 they received these seeds from their Italian gardener. Yellow cherry tomatoes with a sweet, rich flavor and moderate acidity. Isis Candy (Striped), Heirloom, Patio Perfect! 70 days. Determinate. Early and delightful! Round one-inch fruits may vary in shades and blush patterns of reds to yellows, usually with golden flesh. Typically carry an intriguing “cat’s eye” or star in yellow on the blossom end. The flavor is outstanding, sweet and fruity. Smaller vine does well in a container. 70 days. Indeterminate. Elongated 2 inch fruit is green — blushing to pink as they ripen. This tomato gets top marks for flavor: crunchy, tangy, sweet and complex! Casey O’Leary, from Snake River Seeds says the flavor is just “G.D. delicious! !” Green fruits blush pink as they ripen. 60 – 70 days. Indeterminate. Hundreds of ½-¾” dark red cherry tomatoes on each plant. 2014 winner of the Seed Savers Exchange Tomato Tasting. Huge tomato flavor for such small fruits. Great for salads. Plants produce throughout the entire growing season. Best red cherry tomato ever!! Minibel (Red), Heirloom, Patio Perfect! 65 days. Bite-sized fruits with BIG tomato flavor! Petite plants grow less than 2 feet in height and require no support. Loaded with tasty little tomatoes. Excellent choice for containers, pots or hanging baskets; great producer and so cute! Pink Bumblebee (Striped), Heirloom, Returning for 2019! 60 – 70 days. Indeterminate. A stunning cherry tomato! The fruits have a bright, sweet flavor and the color is vibrant fire-engine red with golden orange striping. Vigorous vines yield crack-resistant fruits over a long season. Tolerates cool night-time temps and hot days! Principe Borghese (red), Heirloom, Patio Perfect! 70 – 75 days. Determinate. This was a customer favorite from the start and we’re pleased to bring it back this year. Principe Borghese is an Italian heirloom famous for sun drying. Small, 1-to 2 ounce, grape-shaped fruit are very dry and have few seeds. They have a rich tomato taste that is wonderful for sauces. Vines yield clusters of fruit in abundance! You won’t be disappointed. Sungella (Orange), OP, Organic Seed, NEW for 2019! 60 – 70 days. Indeterminate. Sungella is a Sungold F1 dehybridization, that is deliciously sweet with orange flesh. Fruit is about 1 1⁄2-2” wide — a bit larger than cherry tomatoes and much more split resistant. If you love the Sungold hybrid, but want to save seeds, this is your tomato!! 70 – 80 days. Indeterminate. Everyone loves these! Very sweet, 1 1/2” yellow, pear-shaped fruit great for eating fresh. Very productive plants will keep you in these yellow jewels all summer long! Violet Jasper (striped), Heirloom, Returning for 2019! 72 days. When these little Oriental jewels ripen, your eyes will be stunned with color. They have pretty violet-purple fruit with iridescent green streaks! Fruit weigh 1 to 3 ounces, are smooth and have good tasting, dark purplish-red flesh. Very productive with high yields. We are pleased to offer these again! 80 days. Gorgeous, large (12 to 16 ounces) plums are the epitome of what makes a tomato great for paste and sauces: smooth, meaty, with little core and very few seeds. They are very solid and fragrant, with a rich, well-balanced flavor. And they are superb for fresh eating as well. The plants are robust and very productive. 70 – 75 days. One of my favorite tomatoes! This stunning elongated paste tomato is creamy white to pale yellow in color, and sweet in flavor. Bushy plants are quite productive. Perfect for sauce, salsa, roasting and of course, eating fresh! Martino’s Roma (Red), Heirloom, Patio Perfect! 70 – 80 days. Determinate. Fantastic yields of richly flavorful plum-shaped tomatoes on compact plants that require very little staking. Dry fleshed, meaty 2 to 3 oz. fruits. Great for sauces, salsas and pastes. 80 days. This is a newer selection of this famous Italian cooking tomato. Long, cylindrical fruit are filled with thick, dry flesh and few seeds. This heavy producing variety is a standard for many Italian farmers and chefs.